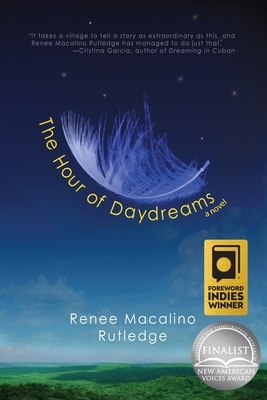 Renee Macalino Rutledge is a long-time journalist from the San Francisco area whose articles and essays have appeared in a variety of publications, including ColorLines, Filipinas Magazine, and Ford City Anthology. Her debut novel, The Hour of Daydreams, employs a Filipino folktale of an unearthly creature who falls in love with a mortal, gives birth to their daughter, and then returns to her home in the stars. This contemporary reimagining of their love story explores the power of myth to reshape reality. Along the way, the author examines marriage, culture, and the role gender plays in defining our place in our own lives. As lyrical as it is haunting, The Hour of Daydreams follows Dr. Manolo Lualhati and Tala, his wife, whom Manolo believes hides a secret, through the brief years of their marriage. "…Besides, I smell smoke. I’m afraid to know what’s lurking in the trees." "You smell it too! It's a kapre for sure. I sense an evil spirit nearby." The story begins with the angry voice of Manolo and Tala's daughter, Malaya, sketching her mother through the eyes of others: "They whisper that my mother was not one of us, and whatever she was disappeared beneath a pair of wings." The daughter's desire to know and understand the mother who abandoned her bookends the tale, but Rutledge shuffles the reader between voices and time as the principal players in the story - Manolo's parents, the maid Luchie, Tala's friend Baitan, and others - add their unique perspectives on Tala's truth. Manolo is tormented by the secrets he suspects his wife is keeping. Is she a woman escaping a seedy city underworld to find love with him in the mountain town of Manlapaz? Or is Tala a star maiden who gave up her wings temporarily to live an earthly life? Unable to resolve the uncertainty these questions raise, Manolo vacillates between love and suspicion, a struggle that leaves him unhappy. "She was family to him now, closer to him than anyone and more beloved, and yet, it was still possible to lie side by side and feel the ghostly scratch of loneliness." After Tala marries Manolo, she makes it a habit to visit the market daily where she meets a young boy, Baitan. The boy is the first of the town's residents to comment on Tala's otherworldliness. It is through his eyes that we see her next and his interpretation adds to the myth and the mystery of Tala. "Baitan knew about her [Tala's] sisters, with whom she shared a strict code of anonymity. They had their rules on making revelations between worlds, but each sister regarded the rules differently, every day more so." The narrative moves in time, demanding that the reader pay attention to the subtle shifts in the family dynamic. Tala's arrival is not unlike the earthquake that for a time isolates the inhabitants of Manlapaz behind a wall of rock and dirt. Lulled by the poetic quality of the writing, the reader roots for Tala to extricate herself from the pull of disaster. Still, every action she takes leads inevitably toward the destruction of the life she is determined to create. "Tala was," Rutledge writes, "like an arrow, already cast, her destination set." It isn't long before we fall under the spell of the daydream. Passages entwine us in the labyrinth of their lyricism. But as much as the writing enchants, it also challenges. What is the meaning behind the city Tala creates from her own imagining? A single nail gave rise to the foundation of a house. From the window of that house she watched the city rise, and out of that city, inhabitants sprang to life, filling the empty rooms and courtyards. Like her, these new inhabitants had no past. But Tala's city gave them each a new face. Matter cannot exist without space, and given a sphere in which to live, the people claimed the validity of their own existences. Rutledge is adept at crafting well-realized characters. The maid, Luchie, is another voice that speculates, formulates, ruminates, and judges Tala. As an observer of the Lualhati household, she is in a unique position to narrate. At times playful, at others almost spiteful, she records the subterranean tremors within the family. Not without bias, however, Luchie colors the tale with her singular opinions. The reader must decide how reliable the old woman really is. When Tala brings a red box home from the market as a test of Manolo's love (he must not open it because she asks him not to), Luchie cannot resist the temptation to peek inside. Then she came across it one day, a blinding hot day like every other, when everything was the same except for it–the box on the shelf, a square-shaped alteration to the previous day. A curiously red detour from a gray blur of worries, worries carried by brittle legs that hoarded memories like colors. She opened it. The box, like everything in Tala's world, is a puzzle waiting to be assembled. Mystery surrounds her as she moves through the day. Has Manolo hidden her wings in the wall of his office? Or is something more ominous secreted there? The boy in the market seems to know who she really is. Or is Baitan merely creating his own fabulous tale to explain her kindness? Her in-laws find her charming despite the enigma of her past, but her presence changes the predictability of their days. As the story unfolds, hints and conjecture give way to unveilings. We learn of a woman who gave birth after an affair with a stranger, acquired an illness, and languished in her bed. We watch a drunk in a bar coerced into a kind of servitude by the owner of the nightspot. Each step forward increases the sense of being off-balance, as though the truth hangs suspended in time and space, in the hour of daydreams, just out of reach. A number of mother-daughter pairings echo the initial struggle by Malaya to understand Tala. Characters give advice or withhold counsel. We see Tala interact with her mother-in-law Iolana; watch her visit with her sisters, who occupy the shop of the albularyo in the marketplace. We eavesdrop on the observations of Luchie, who is estranged from her own grown child. Of course, the question arises. What is the truth of Tala's birth? When she herself conceives, the desire to be a mother conflicts with the desire to find her own path again, and it is Luchie who voices this problem. Luchie was convinced that no good could come from meddling with one's destiny. After working its powers, planting a seed in Tala's womb, the magic would waste no time demanding its due; it would take from Tala's life whatever was necessary to earn back the luck it had forged, or worse, make a profit, with Tala as the losing gambler. The end of the novel returns to the premise that myth has the power to reshape reality. Manolo's confession resolves the mystery behind Tala's disappearance, offering the daughter a way to forgive her mother for leaving. As the story draws to a close, a grown-up Malaya confronts her father about her mother's leaving and listens as he accepts responsibility for the demise of his marriage: "I could see, too late, that . . . we had been the creators all along, not two characters at the mercy of someone else's narration." In The Hour of Daydreams, Rutledge has crafted an exquisitely haunting tale that astounds and confounds, that invites the reader to enter a fabulistic world in search of ordinary truth. Readers who admire stories based on legend, tales that explore the fabulous embedded in the mundane, and those who admire beautiful prose will enjoy the puzzle of Tala's story. Janet E. Irvin is the author of two mystery/thrillers under the name J. E. Irvin. Her stories and essays have appeared in a variety of print and online publications, including Alfred Hitchcock Mystery Magazine, Sherlock Holmes Mystery Magazine, OASIS, and The Zodiac Review. Her poem titled “Pond Song” appears in the latest issue of Mock Turtle Zine. Her essay titled “Solving for Coffee: A Story Problem” will appear in Flights: The Literary Magazine of Sinclair Community College in August of 2018.